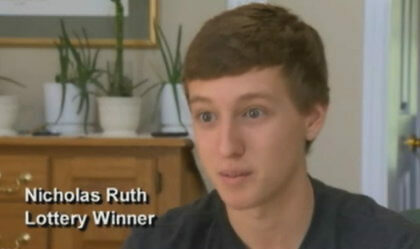 He’s only been playing the lottery for a year – not surpisingly really since he’s just turned 19. But $250,000 is not a bad win rate for your first year playing. Nick says as someone who beat cancer he’s keen to give back in recognition of the care he received at a tough time in his life. So his list of beneficiaries already includes Believe in Tomorrow, the Leukemia and Lymphoma Society and the awesome Make-a-Wish Foundation. The next piece of good news he’s hoping for is acceptance of the law enforcement job he just applied. Good luck Nick.